What a spiritual classic! I just couldn't put it down! I am glad for every person who will read this book...subtle quality, and yet so unmistakably compelling...this lovely Marian Masterpiece..." Sister Teresita, C.G.S. Simply put, this book is a haunting story of the Virgin Mary. The book starts when Mary is visited from an angel. It details beautifully written letters, thought up by the author, of Mary writing about her remarkable life to a friend. The author has included imaginative thoughts that Mary might have written where she talks about what it was like to be chosen as the mother to Jesus and how young Mary thought about it. She also included how Mary dealt with being a refugee in Egypt and what her daily responsibilities were in Nazareth. It's a wonderful book, I found myself feeling emotionally for the characters, and I found it highly enjoyable to read. The book ends just after Jesus' rise to Heaven. 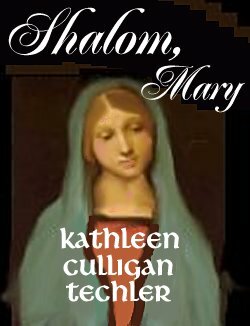 Kathleen Culligan Techler is the gifted author of Shalom, Mary. She lives with her husband in Florida. "She has been a physical therapist, full-time mother of five, and part-time bookkeeper. She is now a proud grandmother. Always an avid reader, Kathleen loves mysteries and a bit of romance. A barrier island off the coast of Florida where she and her husband owned a house is the background for two of her books. When she is not writing or reading she delivers Meals on Wheels, knits hats for newborns, and tutors second graders in reading." A Storyweaver's Book Reviews highly recommends Shalom, Mary by Kathleen Culligan Techler.